Life is tough on the disorganized. I woke up early this morning feeling an urgent need to get a handle on when I planted each of nearly 50 peonies in my garden. Since I started to garden more than 20 years ago, I've kept a journal. It started with a pen and paper and included my observations on what was going on in my garden. I started taking pictures and having them developed (remember those days?) and pasting a few of them within the pages of the journal. 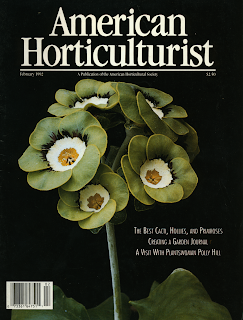 I even wrote an article about the process that appeared in a 1992 issue of American Horticulturist the name of the magazine published by American Horticultural Society at that time. It was called "Constructing and Keeping a Garden Journal." The journals evolved into word-processed pages punched on the side and inserted into a three-ring binder. The results weren't pretty but gave me something to leaf through during the winter. I found some pre-punched pocket pages at an office supply store and put them in the binder for my receipts. by the American Horticultural Society. Around 12 years ago I began to keep track of plant purchases in Word documents, even adding where I'd purchased each one and including a little thumbnail statement on the plant. Sometimes I inserted a lo-res photo. Now I keep receipts from mail order nurseries in a virtual folder in my Outlook e-mail program and slip paper receipts into a manila folder, sometimes remembering to write the name of the plant on the back, sometimes not. Which brings me to today's phenological dilemma. The whole purpose in my sudden need to make a database stems from the apparently unprecedented earliness of blooms. Has this ever happened before? When do my peonies usually bloom when they're at least three years in the ground? Five years? Ten?